GW’s education school could offer its first master’s degree in research methods as soon as this summer, as the struggling graduate school looks to draw in more applicants. The degree would better prepare students in the Graduate School of Education and Human Development to analyze standardized and other types of testing that are completed in schools across the country, professors said. It could also be a way for the school, which has seen its enrollment drop 22 percent in the last five years, to attract new students to Foggy Bottom. Students will take courses that will prepare them to assess the measurements and testing that schools use to gauge how their students are doing, said Joel Gomez, chair of the educational leadership department at GSEHD. Students would be able to complete the 30-credit program in about a year, taking some courses in Foggy Bottom and others online. 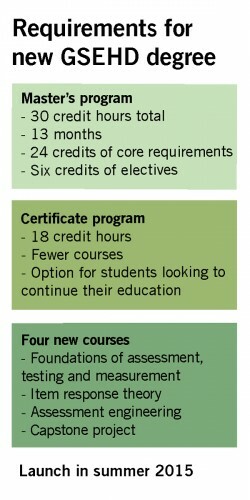 Many of the courses that students will take already exist within the school, but a few will be created from scratch. Gomez said before deciding if any new faculty members would have to be hired, the school would have to begin marketing the degree and determine the size of its inaugural class. The degree is the first new program the school has announced since unveiling its strategic plan, Vision 2020, last spring. Dean Michael Feuer has said he hopes to also launch a doctoral program in education research in the next year. GW’s 10 colleges have been under pressure to roll out new online and hybrid programs, which combine face-to-face and online courses, to rebound from a 2 percent decrease in graduate enrollment last year. That decline stripped $10 million from the University’s budget, which forced it to tighten spending across departments this year. Online programs have been highlighted as a way for the University to target a new group of potential students and bring in more revenue. Professors in the education school have spent about two years developing the research methods curriculum, and will also offer an 18-credit certificate in assessment, testing and measurement. Jaewha Choi, the GSEHD professor who led the creation of the program, said it could catch the eye of some students because it’s compressed from a two-year format to just one year. “International students, who ideally will only spend one year here, they can finish the master’s program,” he said.